Alright, this piece has continued to progress. I’ve mostly concentrated on the head since the last update. I have tweaked the mouth and eyes a bit more and also finished the ears and attached them to the skull. I still have some finer adjustments left to do on the facial area before I am completely happy with her and can move on into the texturing phase. My main focus on this update has been hair styling. 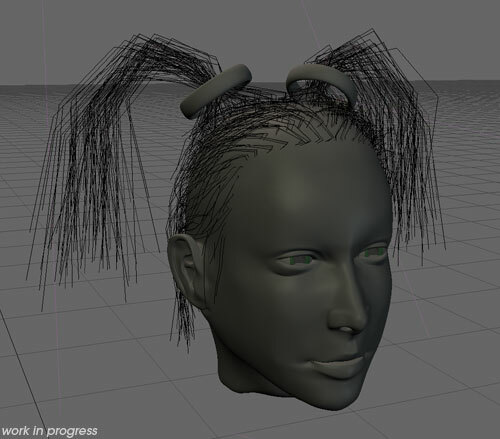 As I am using LightWave, there is a couple of different approaches I can take when making hair. This time I went the Fiber Factory route. I got the Fiber Factory plugin for LightWave a few months back, but I haven’t had the time to get into it until now. I spent about a day playing around with the Fiber modeler until I felt completely comfortable with it and had found a good workflow which gave me the control I was looking for. A day well spent. So this is the result of my first Fiber Factory based hair style. Below is a render where I am in the progress at the moment. I still have some tweaks left to do before I am happy with the hair, but I am starting to get the overall style somewhere in the ballpark of where I am going. And here is an OpenGL shot of the hairguides I’ve sculpted with mainly the Fiber modeler with some additional tweaks in LightWave modeler. I must say after having worked with Fiber Factory now, I’ve begun to find it a very useful and powerful hair plugin. I’ll definitely use it a great deal in my coming projects. I did have to switch between Fiber Modeler and LightWave modeler now and then to be able to get it the way I wanted, though, so there is still room for improvements in the hair styling tools. 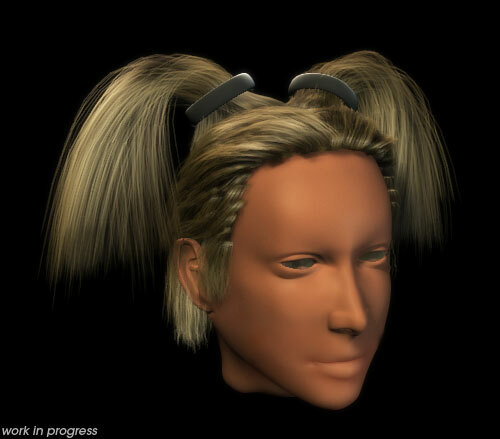 I’ll supply Jon at Binary Arts with my findings and wishes for improved styling tools when this project is finished, and hopefully that might be added to a future version, for an even more elegant hair solution. Hair in CG is something that is quite important to me and fortunately the future for hair in LightWave looks very promising. I am a beta tester of TrueHair, which still have some roads left to travel before becoming production ready, but it starts to show a great deal of potential already. Also, Worley might have a long overdue Sasquatch 3 lurking around the corner in the near future, that might bring even more power to the world of CG hair in LightWave. Well, back to work. Coming up next is the final tweaks to the facial area, so I can start painting the textures and include that in my next post.